Talk to any local outdoor enthusiast for more than a few minutes about their passion, and it’s almost a given that the words “purple lizard” will come up before the conversation ends. 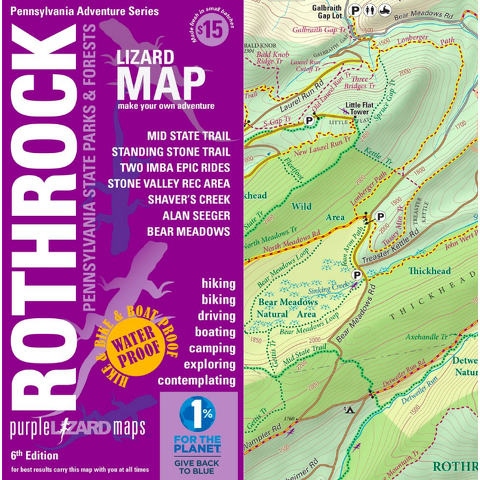 They’re referring to the iconic purple maps that have become a staple for central Pennsylvania adventurers ever since Purple Lizard Maps founder Michael Hermann first published the Rothrock map in 1997. Artistic and creative as a child, Hermann graduated from State College Area High School's Delta program before going on to manage The Bicycle Shop on West College Avenue after one year at Penn State. He became deeply involved in the local outdoors scene, a passion that eventually led him back to Penn State to study geography and cartography, a perfect outlet for his artistic side as well as his outdoor explorer side. Upon receiving his degree in 1995, he took a job at National Geographic Maps in Colorado before going out on his own as an independent cartographer and eventually establishing Purple Lizard Maps. He has since gone on to win design awards in his field. Beyond the aesthetic value, another thing that sets Purple Lizard maps apart from many traditional maps is the fact that information about paved and unpaved roads, hiking trails, mountain bike trails, campsites and river put-ins are all included in one map. Hermann said it takes about 1,000 hours for the Purple Lizard team to complete a map. The company consists of Hermann and his wife, Justine Andronici, as well as one full-time employee, Dave Gantz. Hermann also hires independent consultants to help with field work and cartography. “All of the cartographers we work with are avid outdoors people, because I feel it’s really important that they understand what our map user is looking for,” he said. Purple Lizard currently offers six Pennsylvania maps, as well as maps of areas in Ohio, West Virginia and Puerto Rico. When deciding where to map, Hermann usually looks for places within a five-hour radius of central Pennsylvania. The maps are distributed online at www.purplelizard.com and at 120 different retailers, mainly in nontraditional locations such as coffee shops, microbreweries, outdoor stores and bicycle shops. “We’ve actually turned down chain stores and bigger forms of distribution, because we don’t really want to be associated with that market," said Hermann. "We much prefer to support businesses that mirror our values and outlook." This sort of “anti-corporate” outlook is also reflected by their membership in the organization 1% For the Planet. One percent of Purple Lizard Maps' gross income is donated to participating environmental charities of their choice. He said he has seen a lot of positive movement toward that goal since he first published the Rothrock map 21 years ago. Recreational use of local public lands has increased, and Hermann believes Purple Lizard has played a role in that. Hermann said the company is currently wrapping up the publication of a second West Virginia-based map. Next up is a map of Ohiopyle in southwestern Pennsylvania.